Oble is a conceptual smart asthma inhaler for children ages ranging between 5-12. Oble is a conceptual smart inhaler designed to ease the intake of medicine for children and help parents easily manage their symptoms. How might we design a product for childhood asthma that is not only easy to use, but also empowers confidence in children to regularly take their medications, while helping parents with managing their kid's asthma on an everyday basis? My role mainly revolved around project management, user interface & user experience, and the writing of the script for our marketing video. An easy to use smart inhaler designed for children (5-12) that combines the mechanics of a standardized regular inhaler with a spacer into one single product. Oble helps assist children take their medication more efficiently without any prior assembly. With its mobile companion app and bluetooth technology, Oble allows parents to track the usage and how well their child is doing on a day to day basis. The product can be personalized with different replaceable silicon characters and stickers for a more personalized, and inviting experience for kids. The accompanying application helps monitor the usage of Oble. The designed solution tracks the breathing efficiency and remaining dosage as well as providing users with detailed reports on a weekly basis. To bring our product into fruition, we first had to empathize and understand the current standing of asthma inhalers and their users. We started by conversing with doctors, pharmacists, parents, and day to day users. Our conversations educated us in better understanding the daily challenges of having asthma and inhalers themselves. Following our primary research, we then moved onto creating a PACT analysis that helped our team get a general understanding of asthma and the pain points we wanted to help alleviate. Using our initial research and analysis, we then created user personas to help us narrow in who we were designing for and its solutions. How can we design a product that is inviting and fun for kids to use? How can we involve some sort of personal experience within the product? How can we simplify the overall experience and process of using an inhaler? How could we create a peace of mind for parents? With these questions in mind we began sketching out how our product might look like and kept note of why it was designed that way. After several days of ideation between our team, we presented our concept to professors, parents, and doctors in order to receive feedback on our initial product. After digesting the feedback, we moved onto creating our MVP (Most viable product) and members of our began the 3D design process for the final printed mold. Our end product exerts a fun and inviting tone towards children. Our Oble inhaler can be personalized by swapping in and out different silicone characters. Children can now take their medication without the feeling of being looked down upon and use their inhalers with confidence. The Oble mobile application is designed to help parents manage and administer their children health. The proposed application tracks their breathing efficiency (tidal volume) with each use, remaining dosage, and offers a practice mode in case of any usage problems. Additionally, detailed curated reports can be exported within the application to be shared with doctors. For the visual design we wanted something that would be approachable to a younger audience. To fit those requirements, we decided on using a lighter tone of coral and blue as our two primary brand colours and the usage of BW Modelica as the typography of choice. After the physical component of the product was complete, we moved onto the building our mobile application. We started off by listing down all of the features we wanted to implement and ranking them in terms of priority. We created many low-fidelity prototypes and tested them with other classmates and made adjustments accordingly. My role in the project heavily revolved around the building of the application. At this point in the iteration phase we decided to switch the medium to an iPhone 8. We realized that we weren’t able to text on iPhone X because none of our members had one. Close to to final screens. Our application on-boarding process first goes through the pairing of the application and their Oble. Additionally, a profile set up is done. For first time users, this allows them to complete all the necessities right off the bat with an easy user experience. Before any interaction, receive a quick walk-through of Oble's features. First time users will see pop-ups on each screen explaining the application feature. With detailed reports and you can compare weekly/monthly reporting through Oble’s application. Information such as number of times used can be crucial information in understanding symptoms. A practice mode in order to ensure that parents children are able to optimize their medication intake. This can also be used when parents notice a negative trend in symptoms. Oble was a massive success and won multiple awards within the Toronto design community. 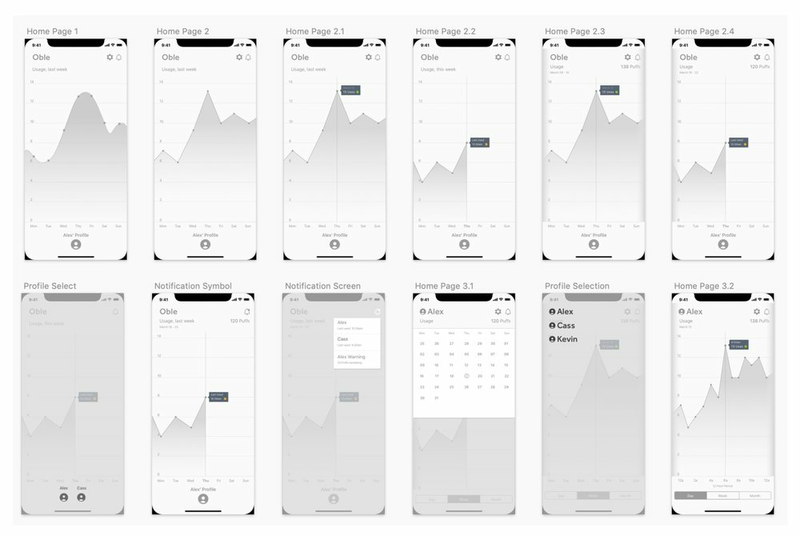 If we had the available time, we would have loved to user test our final iterations one more time to fully validate our product, both from the physical piece to the mobile application. Unfortunately our timeline got cut short, but there were many more design assets that we wanted to create such as proper packaging, marketing material, instruction manuals, and other iteration of our physical device. Please view below on my reflection and future thoughts! To quickly explain our product to the world, we decided to create a promotional video as part of our project. As a team we created the script, found a voice actor, storyboarded, and the video animation. Take a look at our entire Process Document for more details! The ambition for this project was exciting but also daunting. During this period our University was going through a 6 week strike, we could have not done any work and be completely okay. However, we knew that as a team we wanted to created an award worthy product, and that is exactly what we did. “Teamwork makes the dreamwork” was the absolute driver of this project. Coming from all different backgrounds of expertise and skill, we were able to leverage each other’s strengths. I learned that working with others that specialize in different areas than you do is truly a blessing. As a team we were able to collaborate in a way that allowed us to elevate Oble much further than we had anticipated. The main takeaway of this project is definitely the power of working in a team setting where everyone has the same goal. To be able to design a product that could help hundreds of thousands of users and to live up to the standard we wanted was incredible. If Oble were to become a real product, which it definitely could be, we would definitely incorporate an engineer and developer to our team. Being a team full of product designers, we definitely struggled understanding the possibilities of our product, an engineer and developer would definitely help with that lack knowledge and validate feasibility. Assuming a version 1.0 of our product existed, our next steps would be to pilot test with users. Gathering feedback based on actual use would be a measurement of success in our books and re-iterating our product to suit the needs of our consumers. A constant re-iteration process and and development would be implemented. The future of Oble is incredibly viable, if the timing allows for it, our team has already discussed pushing the idea of turning it into a proper business.